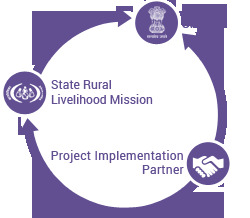 Deen Dayal Upadhyaya-Grameen Kaushalya Yojana (DDU-GKY) is the demand driven placement linked skill training initiative of the Ministry of Rural Development, Government of India. Working under NRLM, it uses skill training and placement in wage employment as a tool to diversify income and enable sustained upward movement out of poverty. DDU-GKY funds private education and skill training experts to start advanced, modern and well-equipped training centres near you. State Governments have a dedicated department or State Skill Missions,who monitor and evaluate these training centres and projects. In these training centres, you will find qualified trainers who will not only train you in a job-oriented skill, but also in using computers, tablets, learning to talk in English and other such life-skills. And after you complete your training program, they will find you a job with reputed organizations. In the training centres, you are entitled to completely free training, with all necessary books & study material, a Tablet PC and uniforms. In residential training centres, you will get free accommodation and food. In non-residential training centres, you will reimbursed for to & fro expenses and one mean for every completed day in training. The training centre will also help you get bio-metric identification cards, a bank account and insurance where applicable. And after you are placed in a job, DDU-GKY will also pay you a salary top-upevery month for 2-6 months depending upon where you are placed. If in your state, in a town of your district, then for 2 months, if in your state and in the district headquarter or bigger town, then for 3 months. If you are placed in job outside your state, then for 6 months. And this money, reimbursement & salary top-up will be directly transferred to your bank account. And even months after you are working in a job, you can always call your training centre or the migration support centre (in the city) set-up by DDU-GKY for any help, or services like registration of complaints, medical check-ups etc. Are you interested? To know more, click here. Wherever you may be in the country, DDU-GKY is near you, within a few hours from your home or village. Do you want to find more? Do you want to find a training centre near you? If you are in Jammu and Kashmir, DDU-GKY has a special program for you, Himayat. If you live in one of the districts affected by Left Wing Extremism, then DDU-GKY has a special program for you, Roshni. Today, DDU-GKY has over 1,100 Training Centres across the country. In the next 2-3 years, more than 2,000 Training Centres will be operational and training people like you for various jobs. Today, DDU-GKY is providing training in more than 330job-oriented trades. In the next 2-3 years, there will be more than 500 job roles to choose from, that will give you access to well-paying jobs in reputed organizations. From a welder making the Maruti car to a Sales Person selling premium shirts to a Back-Office professional working on computers, you can choose from over 330 trades or job-oriented roles DDU-GKY offers training in currently. Skilling programs have been designed keeping occupational standards in mind. Occupational Standards describe what individuals need to do, know and understand in order to carry out a particular job role or function. DDU-GKY offers training programs with curriculum as recommended by NCVT (National Council for Vocational Training) or SSC (Sector Skills Council) of NSDC (National Skill Development Council). The Certificate of Training from NCTV and/or SSC is recognized by the government and most employers in the private sector as a symbol of learning and achievement which will get you a job with higher salary. You can choose from the 39 identified industry sectors, any one of these sectors could offer a career for you!.Choose the trade you want to get training in! But the best thing for you is to be chosen for the training of a skill you are already good at. You can take a test right now to know what you are good at Online test of aptitude. This will tell you what you are good at. Then all you need to do is to go to the nearest DDU-GKY centre offering this course. Aadhaar Card or similar bio-metric Identification Card. A Bank Account in your name. Job Interviews and placement opportunities at no cost. And a job with a minimum salary of Rs. 6,000/- per month. After 12 months of successful training, a job with a minimum salary of Rs. 10,000/- per month. You could also be placed in a foreign job, with a minimum salary of US$500 per month (Rs. 30,000/- approximately). DDU-GKY will definitely change your life. Commit to skill training, discipline and hard work today. Change your life! Allowed file types: jpg jpeg png gif.